From UBC 2013: CRISPRs (Clustered Regularly Interspaced Short PalindromicRepeats) are specific regions in some bacterial and archaeal genomes that, together with associated Cas (CRISPR-associated) genes, function as an adaptive immune system in prokaryotes. While the specific ‘adaptive’ nature of this immunity is still under investigation, it is known that exogenous DNA is processed by Cas proteins into short (~30 base pair) sequences that are adjacent to the Protospacer Adjacent Motif (PAM) site. These short pieces of DNA are then incorporated into the host genome between repeat sequences to formspacer elements. 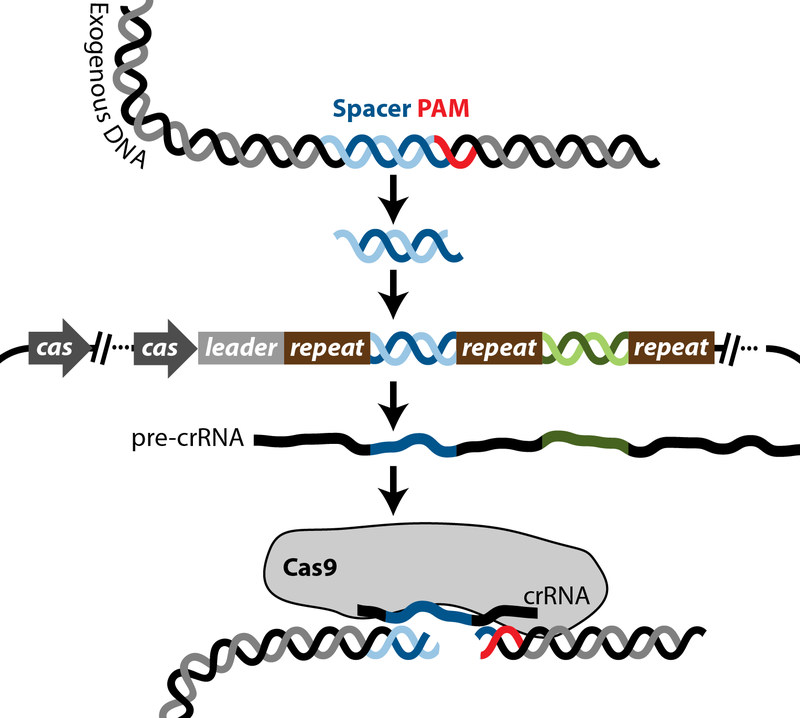 The repeat-spacer-repeat array is constitutively expressed (pre-CRISPR RNAs or pre-crRNAs) and processed by Cas proteins to form small RNAs (crRNAs). The small RNAs are then loaded into Cas proteins and act to guide them to initiate the sequence-specific cleavage of the target sequence. Background from Freiburg 2013: Hidden as an uncharacterized E. coli locus for more than 15 years, Barrangou et al. identified the CRISPR array as a previously unknown adaptive prokaryotic immune system. Almost half of all prokaryotes make use of this defense mechanism against unselective uptake through natural transformation, phage DNA transduction or horizontal gene transfer by conjugation. Invasive DNA or even RNA can be specifically recognized and efficiently cleaved. This unique feature results from the interaction of non-coding RNAs and CRISPR associated (Cas) proteins. From a wide range of known CRISPR subtypes we used CRISPR type II b of S. pyogenes. Acquisition: Invasive DNA is recognized via a protospacer adjacent motif (PAM) – the sequence NGG. A short sequence downstream of the PAM sequence is then integrated into the host CRISPR array and is termed spacer. Spacer sequences transcribe for CRISPR RNAs(crRNAs) which help to cleave sequence-specific invasive DNA. These sequences are located between short palindromic repeats, which are neccessary for the functionality of the crRNAs. Expression/Transcription: The Cas9 endonuclease is expressed. CRISPR array is then transcribed and processed by RNAse III into crRNAs. These contain the complementary spacer sequence and the direct repeat sequence. The crRNA guides the Cas9 protein specifically to invasive DNA sequences. Furthermore trans-activating crRNAs (tracrRNA) are transcribed and bind to the direct repeat part of the crRNA. The tracrRNA is necessary for the formation of a Cas9-RNA complex. Interference: Repeatedly invading DNA, which has been integrated into the CRISPR locus, is detected by the RNA-protein complex and cleaved by Cas9.